We studied the effects of acetonitrile, dimethyl sulfoxide (DMSO), and methanol (MeOH) in human hepatocytes on cytochrome P450 (CYP) and phase II conjugation activities: phenacetinO-deethylation (CYP1A2), coumarin 7-hydroxylation (CYP2A6), tolbutamide 4-hydroxylation (CYP2C9),S-mephenytoin 4′-hydroxylation (CYP2C19), dextromethorphan O-demethylation (CYP2D6), chlorzoxazone 6-hydroxylation (CYP2E1), testosterone 6β-hydroxylation (CYP3A4), and umbelliferone glucuronidation and sulfation. The solvents were evaluated at concentrations (v/v) of 0.1, 1, and 2%. Previously cryopreserved human hepatocytes pooled from multiple donors were used as suspension cultures in this study. DMSO was found to inhibit CYP2C9 and CYP2C19, CYP2E1, and CYP3A4 in a concentration-dependent manner. At 2% DMSO, the activities for the four isoforms were approximately 40% (CYP2C9), 23% (CYP2C19), and 11% (CYP2E1) of that observed for 0.1% acetonitrile and 45% (CYP3A4) of that observed for 1% acetonitrile. No apparent inhibitory effects were observed for the other activities evaluated. Methanol was found to inhibit CYP2C9 and CYP2E1 activities, but to a lesser extent than DMSO. Acetonitrile had no apparent effects on any of the on any of the activities evaluated. These findings should be considered when choosing an organic solvent for metabolism studies with human hepatocytes. In our laboratory, human hepatocytes are used for the evaluation of human drug properties such as metabolite identification, metabolic stability, drug-drug interaction potential, and toxicity (Li et al., 1995, 1999b; Li, 1997;Li and Jurima-Romet, 1997). We recently demonstrated that human hepatocytes can be cryopreserved and thawed without significant compromises in the activities of the major cytochrome P450 isoforms (Li et al., 1999b), thereby suggesting that cryopreserved human hepatocytes may represent a useful experimental system for the evaluation of xenobiotic metabolism. Organic compounds are routinely dissolved in water-miscible organic solvents for in vitro drug metabolism studies. Recently, it has been reported by multiple laboratories that some organic solvents may have inhibitory or stimulatory effects on the activity of cytochrome P450 in human liver microsomes (Chauret et al., 1998; Hickman et al., 1998; Busby et al., 1999). As of this writing, however, there are no published reports on the effects of organic solvents on the drug-metabolizing enzyme activities of intact human hepatocytes. We report here our findings on the effects of the commonly used solvents acetonitrile, dimethyl sulfoxide (DMSO1), ethanol, and methanol on the metabolism of various pathway-selective substrates by previously cryopreserved human hepatocytes. The substrates evaluated are as follows: phenacetin, which undergoes O-deethylation by CYP1A2 (Sesardic et al., 1990); coumarin, which is 7-hydroxylated by CYP2A6 (Miles et al., 1990); tolbutamide, which is 4-hydroxylated by CYP2C9 (Miners et al., 1988; Relling et al., 1990); S-mephenytoin, which is 4′-hydroxylated by CYP2C19 (Relling et al., 1990; Chiba et al., 1993); dextromethorphan, which undergoes O-demethylation by CYP2D6 (Jacqz-Aigrain et al., 1993); chlorzoxazone, which is 6-hydroxylated by CYP2E1 (Peter et al., 1990); testosterone, which is 6β-hydroxylated by CYP3A4 (Guengerich et al., 1986; Waxman et al., 1988; Li et al., 1995); and umbelliferone, which has a glucuronide or sulfate group added by the phase II conjugation enzymes, UDPGT or PST, respectively (Wishnies et al., 1991). The substrates phenacetin, coumarin, tolbutamide, chlorzoxazone, testosterone, and umbelliferone were purchased from Sigma (St. Louis, MO). Dextromethorphan was purchased from Research Biochemicals International (Natick, MA), and S-mephenytoin from CEDRA Corporation (Austin, TX). The ingredients for the buffer were purchased from Sigma: Krebs-Heinslet powder, sodium bicarbonate, calcium chloride anhydrous, gentamicin sulfate, amikacin, and heptanoic acid. The solvents acetonitrile, methanol, and perchloric acid were purchased from Fischer Scientific (Fair Lawn, NJ) and DMSO from Sigma. The metabolites used for standards in high-performance liquid chromatography (HPLC) analysis, 4OH-tolbutamide, 6OH-chlorzoxazone, umbelliferone-glucuronide, umbelliferone-sulfate, and 4OH-mephenytoin were purchased from Ultrafine Chemicals (Manchester, England). Acetaminophen was purchased from Sigma, dextrorphan from Research Biochemicals International, and 6β-hydroxytestosterone from Steraloids (Newport, RI). Hepatocytes from a mixed pool of 10 human donors (5 male and 5 female with ages ranging from 23–84 years old) were used. The cells were isolated, cryopreserved, and thawed according to previously published procedures (Loretz et al., 1989; Li et al., 1992, 1999b). Substrates were initially prepared as 50, 100, and 1000× stock solutions in the organic solvents so the final solvent concentrations at 1× substrate concentration would be 2, 1, and 0.1% (v/v). The final substrate concentrations were as follows: 50 μM phenacetin, 50 μM coumarin, 50 μM testosterone, 50 μM chlorzoxazone, 8 μM dextromethorphan, 75 μM tolbutamide, 50 μMS-mephenytoin, and 12.5 μM umbelliferone. Incubation of hepatocytes with substrates were performed in Krebs-Heinslet Buffer using 24-well plates (500 μl of incubation medium per well) in a Forma incubator at 37°C/5% CO2. The incubation time was 1 h. The reaction was stopped with 500 μl of cold methanol, or 100 μl of perchloric acid forS-mephenytoin. The samples were then centrifuged at 13,000 rpm for 10 min. The supernatant was removed, and the amount of metabolites generated was analyzed by HPLC. The samples were analyzed directly using high-performance liquid chromatography without further treatment. Phenacetin and its acetaminophen metabolite were separated on a phenyl-hexyl column and detected at 245 nm by a variable wavelength detector. Coumarin and umbelliferone, as well as the conjugated umbelliferone metabolites, were separated on a C18 column and detected at 320 nm by a variable wavelength detector. The total CYP2A6 activity was calculated as a summation of 7-hydroxycoumarin and its glucuronide and sulfate metabolites. The separation of tolbutamide and its 4-hydroxy metabolite was also performed using a C18 column, but detected at 230-nm excitation and 302-nm emission wavelengths by a fluorescence detector. Similarly, S-mephenytoin and 4-hydroxy mephenytoin were separated by a C18 column and detected at 223 nm by a variable wavelength detector. Dextrorphan and the parent dextromethorphan were separated by a phenyl column and detected at 270-nm excitation and 310-nm emission by a fluorescence detector. The separation of chlorzoxazone and its 4-hydroxy metabolite was accomplished by a C18 column and detected at 300 nm by a variable wavelength detector. Testosterone and its 6-β hydroxy metabolite were separated by a C18 column and detected at 247 nm by a variable wavelength detector. The rates of metabolism, expressed as a percentage of the activity in the presence of 0.1% acetonitrile, of the various substrates dissolved in acetonitrile, methanol, and DMSO, at final solvent concentrations of 0.1, 1, and 2% are presented in Fig.1. DMSO was found to have the highest inhibitory effects, leading to dose-dependent decreases in activities for CYP2C9, CYP2C19, CYP2E1, and CYP3A4. The activities observed at 2% DMSO, expressed as a percentage of activities at 0.1% acetonitrile (1% acetonitrile for CYP3A4), were 40, 23, 11, and 45% for CYP2C9, CYP2C19, CYP2E1, and CYP3A4, respectively. Methanol at 2% also demonstrated dose-dependent decreases in activity for CYP2C9 and CYP2E1, to 61 and 58% of the activities observed for 0.1% acetonitrile. Acetonitrile, from 0.1 to 2%, has no apparent effects on the activities studied. Effects of organic solvents (A = 0.1% acetonitrile, B = 1% acetonitrile, C = 2% acetonitrile, D = 0.1% methanol, E = 1% methanol, F = 2% methanol, G = 0.1% DMSO, H = 1% DMSO, and I = 2% DMSO) are presented as the percentage of control. The control is represented by 0.1% acetonitrile for all CYP450 activities except CYP3A4, which had 1% acetonitrile as the control. For CYP3A4, the substrate, testosterone, was not found to be readily soluble in 0.1% acetonitrile and 0.1% methanol, so the values were not included (*). The hatched bars and solid bars represent two different experiments run by two different technicians on two different days under the same conditions (n = 2 andn = 3) to demonstrate the reproducibility of the results. In the UDPGT and PST graph, the checkered bars represent the solvent effects on UDPGT and the horizontally striped bars represent the solvent effects on PST. As of this writing, there are no previous reports on the effects of organic solvents on drug-metabolizing enzyme activities in intact human hepatocytes. Studies have been done to determine the solvent effect of acetonitrile, methanol, and DMSO on commonly studied CYP450 isoforms in microsomes (Chauret et al., 1998; Hickman et al., 1998; Busby et al., 1999). In liver microsomes, the solvents are in contact directly with the drug-metabolizing enzymes. In hepatocytes, the drug-metabolizing enzymes, such as the P450 isoforms on the endoplasmic reticulum, are surrounded by cytosolic proteins, which are further surrounded by the plasma membrane. The plasma membrane and cytosolic proteins may attenuate the effects of the solvents. On the other hand, the solvents may exert effects on cellular functions other than drug metabolism (e.g., cytotoxic effects), which may indirectly alter the activities of drug-metabolizing enzymes. It is therefore possible that the effects of the organic solvents observed with liver microsomes may differ from those in intact hepatocytes. The results of our study with human hepatocytes are summarized below and are compared with the findings of others with liver microsomes. Note that differences in observations by different investigators may also be attributable to variations in experimental conditions (e.g., different substrates for specific isoforms). Differences were found in human hepatocytes versus human liver microsomes on the effects of solvents on CYP1A2 activity. Chauret et al. (1998) and Hickman et al. (1998) found acetonitrile (1%) to be an inducer of CYP1A2, and Busby et al. (1999) showed no effect of acetonitrile at 1% but an inhibitory effect at 3% in liver microsomes. In hepatocytes, we demonstrated that acetonitrile has no apparent stimulatory or inhibitory effects on CYP1A2 (up to 2%). We observed no effects of methanol on CYP1A2 activity as measured by phenacetin metabolism in human hepatocytes, as was also observed byChauret et al. (1998) and Busby et al. (1999) with microsomes. This is in contrast to the findings by Hickman et al. (1998) of strong inhibition by methanol (1%) of CYP1A2 activity using caffeine as a substrate in liver microsomes. Hickman et al. (1998) also found inhibition of CYP1A2 in the presence of DMSO (1%) in microsomes, while we found DMSO to have no effects on CYP1A2 activity in hepatocytes. The difference in observation between Hickman et al. (1998) and others on the inhibitory effects of DMSO is not clear. The use of caffeine as a substrate by Hickman et al. (1998) and phenacetin by us and others may contribute to this difference. All three laboratories found some inhibition of CYP2A6 in the presence of acetonitrile (at 1–3%) in microsomes, while in hepatocytes, we observed no inhibition (up to 2% acetonitrile). In both hepatocytes and microsomes, methanol and DMSO was observed to have no effect on CYP2A6. We found acetonitrile to have no apparent effects on CYP2C9 activity in hepatocytes. Similarly, Hickman et al. (1998) and Chauret et al. (1998)found no effects of acetonitrile in microsomes, but Chauret et al. (1998) found stimulation of CYP2C9 activity in microsomes in the presence of 5% acetonitrile. Hickman et al. (1998) and Chauret et al. (1998) observed inhibition of CYP2C9 activity by methanol and DMSO (at 1% and higher) in microsomes, as we observed also in hepatocytes (at 2% methanol and 1 and 2% DMSO). Busby et al. (1999) did not find any inhibition of CYP2C9 by methanol or DMSO, which could be due to the choice of substrate. Busby et al. (1999) used diclofenac, whereas we, as well as the other two laboratories, used tolbutamide as the CYP2C9 substrate. In hepatocytes, we observed no apparent effects of acetonitrile or methanol on CYP2C19 activity. Hickman et al. (1998) found no effects of acetonitrile or methanol on CYP2C19 in microsomes, while both Chauret et al. (1998) and Busby et al. (1999) found inhibition by high concentrations of acetonitrile and methanol (at 5 and 3%, respectively). The results of our study show that DMSO was inhibitory toward 2C19 (at 1% and higher) in hepatocytes, which is in accordance with the observations made, using microsomes, in all three laboratories (at 0.1% and higher). We found that none of the solvents studied have any apparent effects on CYP2D6 activity in hepatocytes. Hickman et al. (1998) found no effects of acetonitrile on CYP2D6 activity in microsomes, while both Chauret et al. (1998) and Busby et al. (1999) found inhibition by acetonitrile (at 5 and 3%, respectively). Only Busby et al. 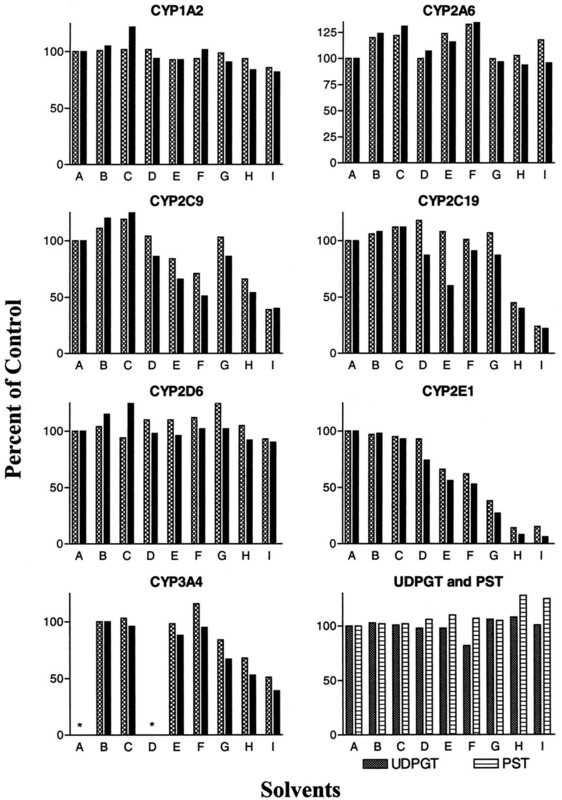 (1999) found inhibition of CYP2D6 activity in microsomes by DMSO (1% and higher). Dextromethorphan O-demethylation was used by our laboratory, as well as by Chauret et al. (1998) and Hickman et al. (1998), to analyze CYP2D6, but Busby et al. (1999) used bufuralol 1′-hydroxylation, which may explain the inhibition of CYP2D6 activity by DMSO observed only by that laboratory. Acetonitrile had no apparent effects on CYP2E1 activity in hepatocytes. Only Chauret et al. (1998) found inhibition of CYP2E1 at high concentrations of acetonitrile (5%). Hickman et al. (1998) and Chauret et al. (1998) reported inhibition by methanol (at 1% and higher) and DMSO (at 0.1% and higher) on CYP2E1 activities in microsomes, which is in agreement with our observation of dose-dependent inhibition by methanol and DMSO in hepatocytes. Busby et al. (1999) did not report on the effects of solvents on CYP2E1 activity. We did not observe any apparent effects of acetonitrile or methanol in hepatocytes on CYP3A4 activity. Hickman et al. (1998) found no effects of acetonitrile, methanol, or DMSO (1%) on CYP3A4 activity in microsomes. Both Chauret et al. (1998) and Busby et al. (1999) found inhibition by acetonitrile and methanol (at 5 and 3%, respectively, for both solvents) in microsomes and even stronger inhibition by DMSO (at 0.1% and higher) in microsomes. We also observed inhibition of CYP3A4 by DMSO (at 1% and higher) in hepatocytes. One advantage in the use of intact hepatocytes is that both phase I oxidation and phase II conjugation can be studied. We therefore also studied the effects of the organic solvents on umbelliferone glucuronidation and sulfation. We found that the three organic solvents at the concentrations studied had no apparent effects on glucuronidation and sulfation activities. As of this writing, there is no previous published information concerning the effects of organic solvents on the activity of phase II metabolizing enzymes. Our findings show that the choice of solvents may affect the activities of drug-metabolizing enzymes in hepatocytes. DMSO, because of its ability to dissolve a large number of organic chemicals, is usually the solvent of choice. However, our findings with intact human hepatocytes and others with liver microsomes show that DMSO may not be appropriate for substrates of CYP2C9, CYP2C19, CYP2E1, and CYP3A4. None of the three organic solvents studied have apparent effects, up to the final concentration of 2%, for CYP1A2, CYP2A6, and CYP2D6 activities in human hepatocytes. Of the three solvents, acetonitrile apparently is the solvent with the fewest effects on the activities of drug-metabolizing enzymes and therefore may be the most appropriate solvent to be used in drug metabolism studies with intact human hepatocytes. However, it is always prudent to evaluate the potential effects of organic solvents for in vitro xenobiotic metabolism studies, especially when a new chemical entity is being evaluated. We gratefully acknowledge the following colleagues for their contributions: Blaise Considine for editorial support, Drew Fackett for HPLC support, and Paul Silber for management support. (1999) Effect of methanol, ethanol, dimethyl sulfoxide, and acetonitrile on in vitro activities of cDNA-expressed human cytochromes P-450. Drug Metab Dispos 27:246–249. (1993) Development and preliminary application of a simple assay of S-mephenytoin 4-hydroxylase activity in human liver microsomes. Eur J Clin Pharmacol 44:559–562. (1993) CYP2D6- and CYP3A-dependent metabolism of dextromethorphan in humans. Pharmacogenetics 3:197–204. (1999a) Effects of cytochrome P450 inducers on 17α-ethinyloestradiol (EE2) conjugation by primary human hepatocytes. Br J Clin Pharmacol 48:733–742. (1997) Applications of primary human hepatocytes in the evaluation of pharmacokinetic drug-drug interactions: Evaluation of model drugs terfenadine and rifampin. Cell Biol Toxicol 13:365–374. (1995) Substrates of human hepatic cytochrome P450 3A4. Toxicology 104:1–8. (1999b) Cryopreserved human hepatocytes: Characterization of drug-metabolizing enzyme activities and applications in higher throughput screening assays for hepatotoxicity, metabolic stability, and drug-drug interaction potential. Chem-Biol Interact 121:17–35. (1992) Isolation and culturing of hepatocytes from human liver. J Tissue Culture Methods 14:139–146. (1989) Optimization of cyropreservation procedures for rat and human hepatocytes. Xenobiotica 19:489–498. (1990) Identification of the human liver cytochrome P-450 responsible for coumarin 7-hydroxylation activity. Biochem J 267:365–371. (1988) Tolbutamide hydroxylation by human liver microsomes: Kinetic characterization and relationship to other cytochrome P-450 dependent xenobiotic oxidations. Biochem Pharmacol 37:1137–1144. (1990) Furafylline is a potent and selective inhibitor of cytochrome P450IA2 in man. Br J Clin Pharmacol 29:651–663. (1988) Human liver microsomal steroid metabolism and identification of the major microsomal steroid hormone 6β-hydroxylase cytochrome P450 enzyme. Arch Biochem Biophys 263:424–436. (1991) Biotransformation activity in vitrified human liver slices. Cryobiology 28:216–226.